Robert Lee “Bob” Gaddis, 77, of Owensboro passed away Thursday, April 11, 2019 at Owensboro Health Regional Hospital. Bob was born in Daviess County on March 21, 1942 to the late Ernest Gaddis and Rowena Kincaid Gaddis. He was retired from CSX Railroad where he worked as signal foreman for 35 years, and was a former member of the United States Army. 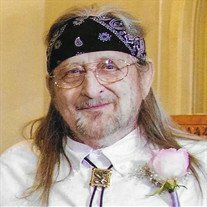 Bob was a member of the Woodlawn Methodist Church, past member of Fort Hartford Muzzle Loaders Club, and past president of the Fraternal Order of the Eagles. He enjoyed gardening and hunting. Along with his parents, Bob was preceded in death in 2013 by his wife, Janice Hicks Gaddis, his daughter, Terri Gaddis, brother, Teddy A. Gaddis, his sisters, Fay Gansky and Karen “Scotty” Kay, and step-grandson, Cody Carlisle. Bob is survived by his children, Donna (Thomas) Porter, Janet Bristow, Mark Gaddis, his step-children, Howard (Tammy) Cox, Valerie (Eddie) Smith, Sherrie Hamilton, Lisa Shelnutt, his siblings, Gail Martin, Jo Ann Byrd, Linda (Lou) Drawdy, Margaret “Jeanie” (Eugene) Johnson, Phillip (Nancy) Gaddis, Sandy (James) Travis, his grandchildren, Lucas Porter, Rachel (Zach) Day, Leigh Bristow, Katee Bristow, his step-grandchildren, Tiffany (Josh) Horn, Zachary Carlisle, Tammy Teves, Chad Cox, Charles Cox, Tabitha Avila, and 11 step great-grandchildren. Services will be 11:00 am Monday, April 15, 2019 at Haley McGinnis Funeral Home & Crematory, with Pastor Myke Templeton officiating. Burial will follow at Elmwood Cemetery. Visitation will be from 4:00 pm to 8:00 pm Sunday, and again from 10:00 am to 11:00 am Monday at the funeral home.